This book, the first of three volumes, chronicles a highly personal journey, with plenty of loafing stops along the way, through the hills and hollows of Southern Appalachia, in search of the tastes that define and sustain the region’s people. Join food writer Fred Sauceman as the sorghum syrup thickens in September, as the First Family of Country Music repeats the late summer ritual of making the vinegary, vegetable-packed relish called chow-chow in Virginia, and as ramps, audacious cousins to the green onion, first push through winter’s leaves on the forest floor near the Cherokee reservation in North Carolina. Learn pimento cheese techniques from octogenarian pharmacists, eat gas station pizza off a warm car hood, and revel in the simple but ingenious concoction called “Beans All the Way.” The Place Setting takes readers through a mountain hollow fragrant with hickory smoke from barbecued hams, NASCAR-enshrined burger bars, and an obscure steakhouse in the Smoky Mountain foothills where diners eat “Wormy Steaks” and pledge organ donation. In a region largely overlooked by the national food press, we taste a square burger survivor at the last remaining Blue Circle, meet the dumpling diva, and tackle the chili-laden pork chop sandwich at the Snappy Lunch in Mount Airy, North Carolina. 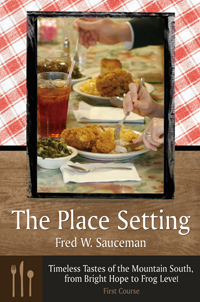 And look for the second serving of The Place Setting as it recounts the lives of three early television cooks, recalls a legendary hotdog vendor who ran for president, and profiles the most colorful and controversial grocer in the history of Southern Appalachia, known for luring customers by pitching chickens off store roofs.